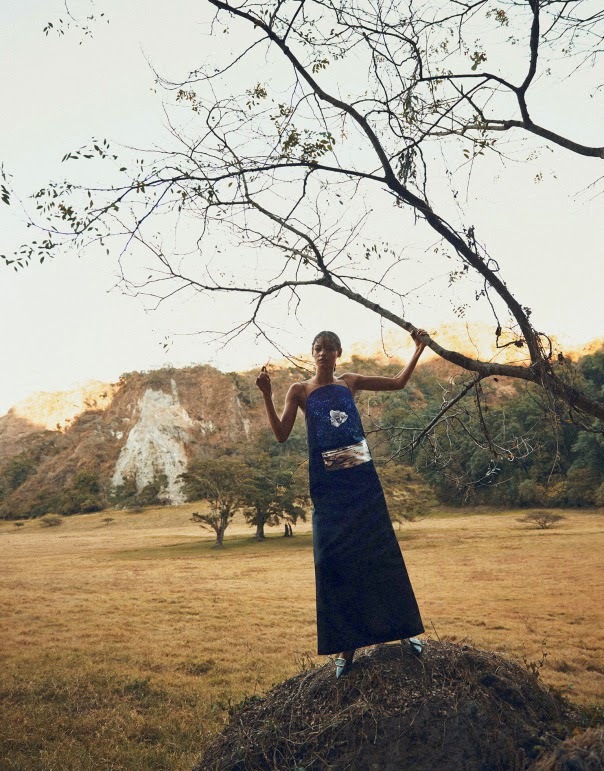 Kenyan-born British model of the moment Malaika Firth gets in touch with nature and her spiritual side in an editorial shot by Norman Jean Roy for Porter Magazine. "Days of Heaven" features the New York Model Management-repped beauty as she explores the sprawling highlands of the Hacienda de San Antonio estate situated in western Mexico. Firth's serene beauty strikes a harmonious chord as she surveys the stunning 5,000 acre nature reserve and tends to the livestock while decked out in free-flowing ensembles styled by Fashion Editor Tom Van Dorpe from the Fall/Winter 2014 collections of Emilio Pucci, Alexander Wang, Lanvin, Stella McCartney, and Proenza Schouler. Initially discovered by Premier Model Management's founder Carole White at an open casting call, Firth has firmly staked her place amongst modelling's elite courtesy of consecutive campaign slots for Prada and Burberry Prosum, and a ubiquitous presence at the Spring/Summer 2014 and Fall/Winter 2014 collections. Standing at a modest 175 cm, Firth makes up for her diminutive stature with charisma aplomb, an endearing doe-eyed expression, and a one-of-a-kind jaw-dropping beauty. Firth has fashion editors, photographers, and stylists alike under her spell with a deluge of editorial appearances for 032C, W, Interview, i-D, and the American, Italian, French, Japanese, and British editions of Vogue.